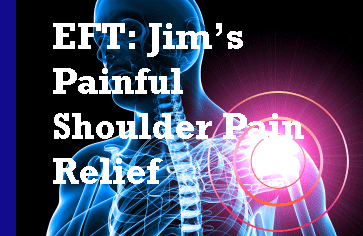 I previously published an article about Jim and how his discomfort and restriction in his shoulder movement had gone within 15 minutes after he volunteered for me to use the EFT, Chase the Pain approach at the EFT Training. Well, here is the interview I conducted with Jim as he talks about EFT and his problem. Jim had been recommended to have surgery for his problem but was unable to do so because of other issues he had. This problem had affected his body, muscles and limited his activities. Jim has remained free from this problem. It is now approximately two years after his treatment with EFT. The full range of movement returned to this side of his body.